A customer came in with a complaint that when he turned on his fridge that his batteries would be dead after only 6 hours of use. The first test was to see what the amp draw on the fridge was. It was less than .5A. Next I tested the total amp draw of the coach with only the fridge on. Less than 1A. So I checked the voltage on the batteries 13.6V. Hmmm…thats pretty high for batteries just by themselves. Next I wanted to know what the charge amperage was to the batteries. <2A. That’s basically a trickle charge. So I hooked up a jump pack in parallel and the charge amperage jumped to 8A. Lastly I put 2 new group 24 batteries in and let the fridge run overnight without it plugged in. Total voltage drop was only .1V. I then turned the entire coach on furnace and all without it plugged in for 4 hours the draw was approx 14A and the voltage dropped from 12.00V to 11.79V during that time. When plugged back in the charge amperage was 25A and when checked later was 13A. Conclusion: The optima starter batteries are designed to keep as high a voltage as possible for starting purposes but the RV converter adjusts the charge amperage by sensing the battery voltage. Therefore the batteries where never getting fully charged. 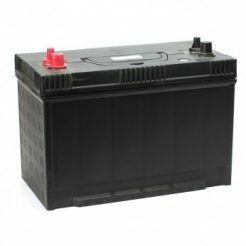 By putting deep cycle batteries in the charger was able to work properly and the problem was solved. This entry was posted in Camping and tagged Batteries, charging, Optima. Deep-Cycle. Bookmark the permalink.